"Sorry you got twisted up in this scene. From where you're kneeling, it must seem like an 18-carat run of bad luck. Truth is... the game was rigged from the start." 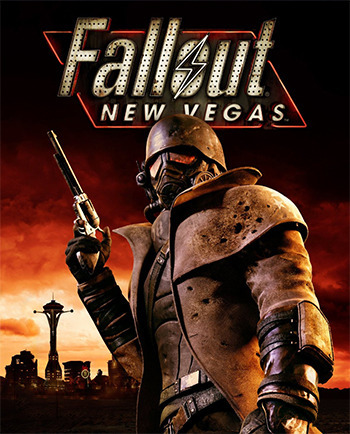 Fallout: New Vegas is an RPG/third/first-person shooter from Obsidian Entertainment. The game is the fifth (canonical) game in the Fallout series, and chronologically takes place after Fallout 3, but it is not the next numbered main game in the series (kind of what Vice City was to Grand Theft Auto III). A good chunk of the development team were exiles from the late Black Isle Studios — responsible for Fallout 2 and the canceled Van Buren — which led to much rejoicing. Thus, in a way, New Vegas serves as a more direct sequel to Fallout 2 than the actual Fallout 3, with many themes, characters, and factions from the former making their return. It's 2281, and the Mojave Wasteland is an okay place to live. It doesn't have as many problems as most places do, what with it being relatively radiation-free with lots of creature comforts. There's a bit of a gambling problem, but that's fine. Stimulates the economy, hey? And then there's Mr. House, a businessman with a lucky streak living a life of seclusion in the Lucky 38 Casino, from which he rules over New Vegas — a city with lights shining bright like the blue moonlight, thanks to the power from the Hoover Dam. Well, Caesar's Legion is a bit annoying, what with their rampant slavery and fanatical devotion to the ideas of ancient Rome; and the extremely persistent New California Republic, while not nearly as bad as the Legion, clearly intends to make the technologically gifted New Vegas part of their nation, whether through political means or forceful annexation. That's all somebody else's problem, though. You? You're The Courier, one of the best messengers around, as long as the package isn't too big. And this one really isn't. It's almost boring, even. But hey, you get to go to New Vegas, the biggest, brightest city in the wasteland. Should be pretty fun, right? Guess again. Only a few days into your trip, a mysterious man in a checkered coat and his posse of leathered-up thugs shoot you in the head and take your package, leaving you for dead in a shallow grave. Normally you would be dead now, but luckily, you manage to cling to life just long enough for a friendly robot that thinks he's a cowboy to dig you up. The game recieved four DLC expansion packs: Dead Money, Honest Hearts, Old World Blues, and Lonesome Road. Dead Money has the Courier brought to a legendary pre-war ruin, the Sierra Madre Casino, in a Survival Horror-style map with scarce supplies and many environmental hazards. Honest Hearts takes the Courier north to intervene on a tribal war around Zion National Park, in a story about the Courier and other characters dealing with a tribe of people descended from the locals of Utah and a few neighboring vaults. Old World Blues sees the Courier abducted by a gang of insane scientists who need their help to escape the boundaries of their lab, which is full of amazing and horrific scientific advancements. The final add-on, Lonesome Road, has the Courier answer an "invitation" to travel to the Divide, an even more devastated locale than the Capital Wasteland, and meet someone named Ulysses, who seems to know a lot about them. The four add-ons are advised to be played in the order they were originally released as listed above, as together they form a Myth Arc, along with potentially-overlooked details in the main game, foreshadowing events and characters in later add-ons, all building up to the confrontation with Ulysses in the Divide. Two more small DLCs were released on September 27, 2011: Courier's Stash, which is a bundle of the four pre-order equipment packs, and Gun Runners' Arsenal, which adds more weapons, mods, ammo, and crafting recipes to the game. Finally, in February 2012, the Ultimate Edition was released - the game and all of its downloadable content in one package. As its predecessors, Fallout: New Vegas benefits from a lot of content crafted by the community, from silly inoffensive content to complete new questlines. Between those two points, name it (new companions, Bonus Bosses and Bonus Dungeons, cosmetic graphical overhaul, new clothes, new weapons, drivable cars, fixes to weird developers decisions, smokable cigarettes, new perks, etc), youre almost sure to find it. note Oh, and before you ask, the answer is yes. It also spawned an Affectionate Parody series, Courier's Mind: Rise of New Vegas. As well as a Fan Film, Fallout Lanius.